The name Ottawa is from the Indian word “adawe” meaning to trade. This name was appropriate because of the extensive trading with other tribes and their eventual involvement with the French. In 1615, the Frenchmen recorded meeting the Ottawa near the French River in Canada. The Ottawa became very important to the fur trade. The Ottawa would go out and trade other tribes for their fur and then in turn would trade that to the French. The Ottawa were generally counted as allies of the Huron and the French during the French and Indian War. One of our greatest Indian Chiefs to appear on the American continent was Chief Pontiac. Pontiac was the head of a loose confederacy consisting of Ottawa, Ojibwa, and Pottawatomie. The Ottawa Tribe of Oklahoma is made up of descendants of the Ottawa who, after migrating from Canada into Michigan, agreed to live in the area around Fort Detroit and Maumee River in Ohio. After the passage of the Indian Removal Bill in 1830 they were removed to villages in Ohio, Illinois, and Michigan. Then in 1833, they signed over these lands. They were very hesitant to move and it wasn’t until April 1837, that the Ottawa of Blanchard’s Fork Roche de Boeuf and Oquanoxies’s Village agreed to immigrate to a new site in Kansas. Within five years of the move nearly half of the Ottawa had died. The Ottawa knew that in order to survive their children must be educated. In 1862, the Ottawa were allotted 74,000 acres of land that would be used and sold to raise money to build a Baptist school for the education of whites and Indians. This university was named after the Ottawa. The Indians made an arrangement with the university that the Ottawa children would receive education free of charge. The reservation where the Ottawa lived became a township named after them. They lived there until 1867. In 1867, the Ottawa sold their land in Kansas and moved into Indian Territory in Oklahoma. By this time more of the Ottawa had died and only about 200 were left. In Oklahoma they entered into a contract with the Shawnee tribe to purchase approximately 14,863 acres which was part of the Shawnee reservation. In 1956, the US decided that the Ottawa served no purpose and terminated them. This was a long dark period in the Ottawa history, but they did not give up and on May 15, 1978, the Ottawa Tribe was reestablished as a federally recognized government. The government structure of the Ottawa Tribe of Oklahoma was made up of band chiefs who formed a governing council with a head chief. Each band elected their own chief and then these chiefs would elect a head chief. Now we have a chief, second chief, a secretary/treasurer, first councilman, and second councilmen. These people are elected from every member of the Ottawa Tribe of Oklahoma age 18 and over. 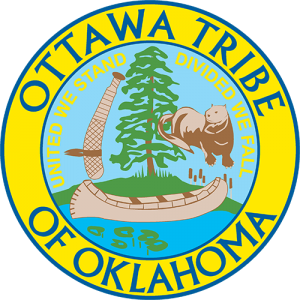 The Ottawa Tribe of Oklahoma is headquartered in Miami, Oklahoma with Tribal Jurisdiction in Ottawa county, Oklahoma. The Ottawa Tribe of Oklahoma offers Ottawa language classes. Today the Ottawa Tribe of Oklahoma is strong and doing well. The tribe operates a Community Health Program and the Healthy Living Center in Miami, as well as a Department of Environmental Protection. The tribe publishes the Adawe News for its tribal members. The Ottawa Tribe issues its own tribal vehicle tags. They operate two tribal smoke shops; one gas station, and the Otter Stop Convenience Store. In addition, they operate the High Winds Casino. Their annual economic impact is estimated by the Oklahoma Indian Affairs Commissions to be $3 million.